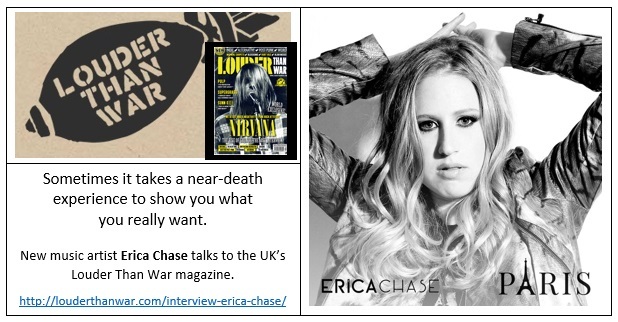 Erica Chase was recently featured on ‘Louder Than War’; The go-to website for the latest rock, punk, metal and alternative music news, album and gig reviews! Recording artist Erica Chase, has just released her new single/video, entitled: “Paris”, and it is powerful! Louder Than war spoke to Erica, who is not only a talented songwriter, and singer, but has a running knowledge of the music industry, and eerie sense of what is supposed to happen and why when it comes to her music. Meeting her now, longtime manager, Dana Strum from the heavy metal band, “Slaughter”, and then nearly dying 24 hours later, was viewed by Erica as a sign to follow her dream.